"Are you going to do another Baja Ride this year?!?" This is all I have heard from 90% of the GS riders coming into the shop. This is a great deal of work to organize, & a load of responsibility on the ride. I took a break from the guide gig this year & enjoyed a solo ride in Baja. However with a new ride under me, I will be gone for the month of February riding in Baja California MX. A place I have come to love. I have been in touch with the Z-Man, Frank of ZMW Adventures of Tucson AZ. who also has a new bike, and will be down in Baja in February. We have discussed providing, a Guided Adventure Tour of Baja Back Roads for 2010, and will do one on the dates listed below. Here is your chance to enjoy 2 weeks of some of the finest GS riding in North America. This will be an adventure ride, gravel travel, camping, NO support van. 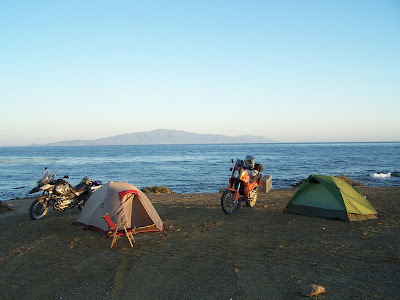 Just you, your gear, your GS & 2 experienced Baja Riders, (who are also BMW mechanics) as your guides. This will be enjoyable to all new comers as well as seasoned Baja riders, new roads, Jesuit Missions, Whale Watching, and advetures aplenty you will not forget. We will assist you with preparation of your paperwork, all your insurance needs, your gear and your bike, which will be necessary. Is a trip for the experienced GS / ADV Rider. Approximately 75% gravel roads w/ rocks & sand. Email Dave for details & to Reserve your spot now!